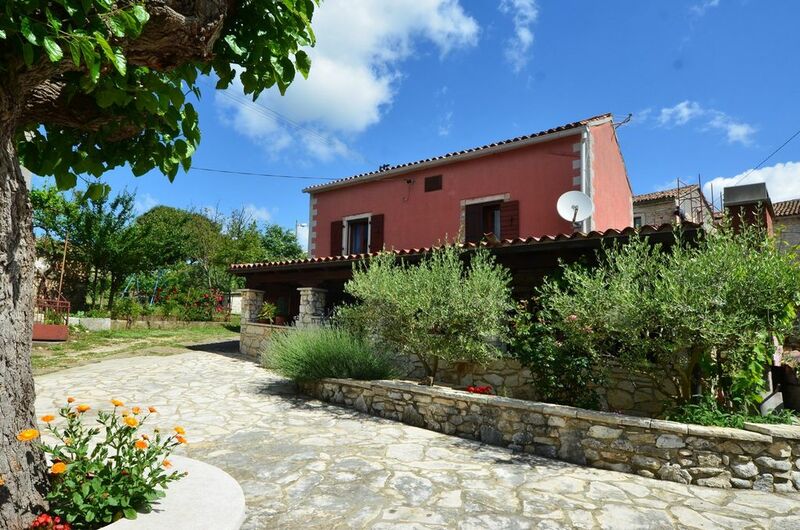 This detached holiday home is located in a small Istrian village Kruncici, near the famous tourist resorts of Rovinj, Vrsar and Porec. It is situated on the edge of the village in a quiet environment. Large covered terrace provides pleasent shade where you can relax in the fresh air and have your breakfast, lunch and dinner. There is also a large outdoor fireplace for grill. The ground floor has a bathroom, a large kitchen with dining area and in the extension a small living room. Wooden stairs leads you up to the first floor where there are two spacious bedrooms. Nearest beach in Vrsar is distant only 15 minutes drive and in the vicinity there is a famous Lim fjord. This detached holiday home is located in a small Istrian village Kruncici, near the famous tourist resorts of Rovinj, Vrsar and Porec. It is situated on the edge of the village in a quiet environment. Large covered terrace provides pleasent shade where you can relax in the fresh air and have your breakfast, lunch and dinner. There is also a large outdoor fireplace for grill. Nearest beach in Vrsar is distant only 15 minutes drive and in the vicinity there is a famous Lim fjord.